The bus ride from Puno to Arequipa was the best we’ve had so far. We paid slightly more through Cruz del Sur than we needed to (S/54, CAD$18.60), but it was totally worth it. We had front row seats, a meal (read: sandwich, cookies, and juice), and a movie. Not to mention, a clean bus that didn’t stop at every rest stop in the Peruvian wilderness. 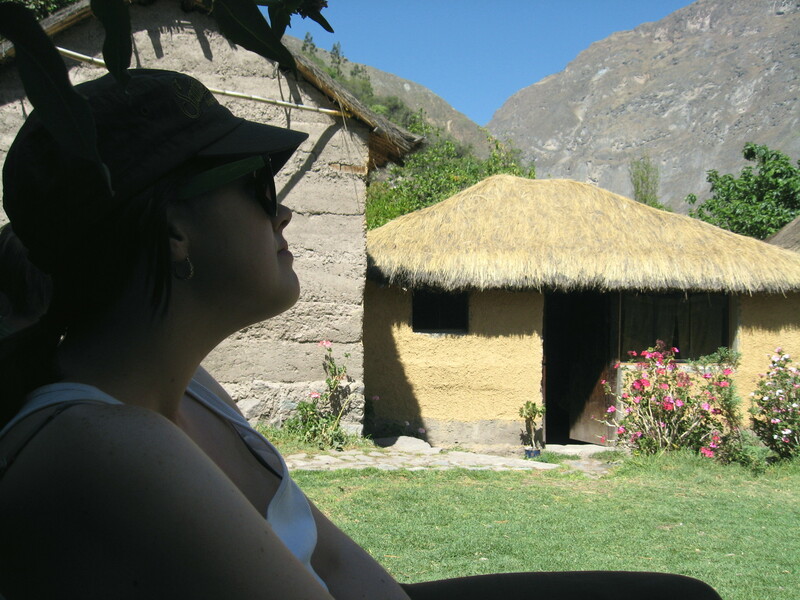 We arrived in Arequipa around 8 or 9pm and took a taxi for S/6 (CAD$2) from the bus station to Amazing Home Backpackers (S/70/CAD$24 for a private double with en suite bathroom per night). Alex, the hostel owner, was friendly and helpful and gave us information about the two- and three-day tours to Colca Canyon. We left our laundry with Alex the next morning after breakfast. Breakfast at Amazing Home Backpackers was a treat. A rooftop patio serving freshly prepared banana pancakes with dulce de leche. With bellies filled with pancakes we went out to explore Arequipa. Arequipa is definitely one of our favourite Peruvian towns. There is a large pedestrian area with lots of shopping and cafes strewn about. We stopped in at La Canasta bakery (Calle Jerusalen 115) for lunch. They had some amazing sandwiches on their menu. I had chicken and avocado and Ryan had a toasted chicken and mushroom sandwich. They were very delicious and fresh. We also had a big garden salad for a total of S/25 (CAD$8.50). When we got back to the hostel that night Alex told us that our laundry wasn’t completely done because the town hadn’t had water for most of the day. He gave us what he had managed to do and promised to give us what we needed for our hiking trip to Colca Canyon in the morning before we left. We were leaving at 3am so we went to bed a little nervous we wouldn’t have any socks or t-shirts to hike in the next day. Sure enough, Alex was up at 3am to give us our socks… though slightly damp. 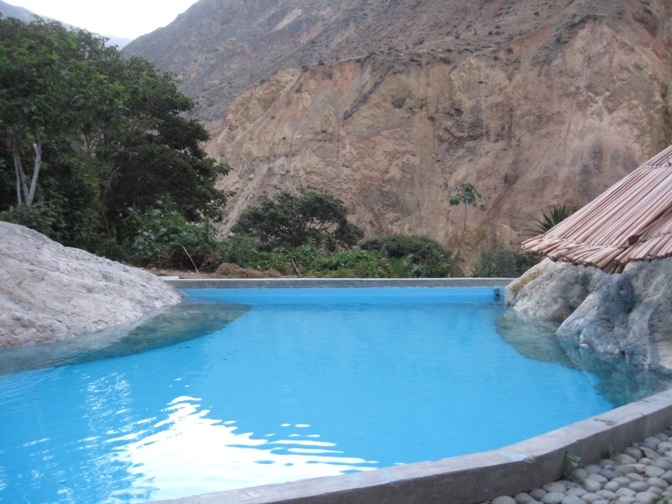 We had booked our Colca Canyon trip through Royal Trips (Santa Catalina 200, Arequipa) for S/115 (CAD$39.60) per person. We opted for the one night trip which involves seeing the condors fly, hiking into the canyon with a stop for lunch on the way, overnight stay at the oasis, and hike back out the next morning. Some people opt for the two-day tour as you get a little more time at the oasis and there are less hours of walking in a day. The Colca Canyon is Peru’s third biggest attraction. It’s commonly listed as one of the 1000 Places to See Before you Die. It’s twice as deep as the Grand Canyon, with a depth of 13,650 feet. Simply put, it’s breath-taking — specially if you are hiking it. 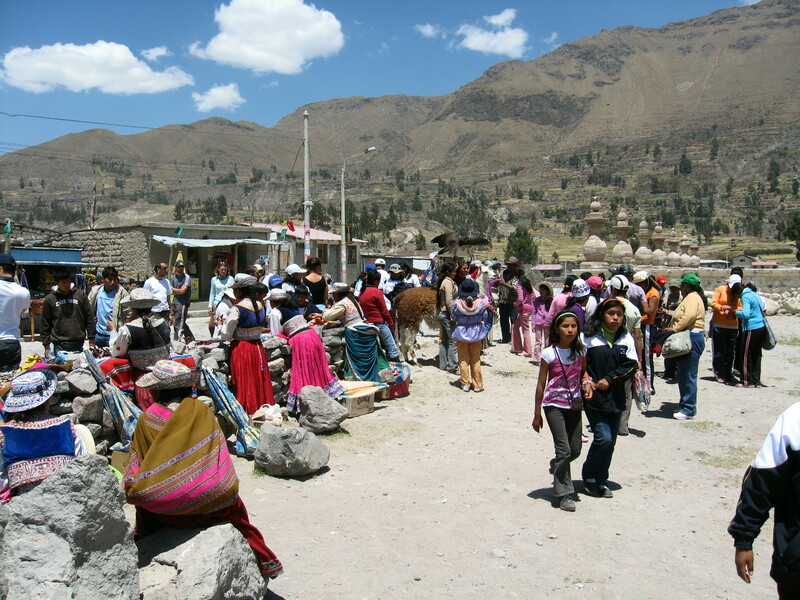 We took a two-day, overnight tour to Colca Canyon from our base in Arequipa through Royal Trips (Santa Catalina 200) for S/115 (CAD$41) per person. We were picked up from our hostel in Arequipa by a minibus at 3am and headed out to the Colca Canyon. We stopped for a buffet breakfast somewhere along the way. It was very early and we hadn’t had much sleep the night before, so everything before 8am seemed like a dream. I just remember it being so very, very cold. We arrived at Cruz del Condor around 8:15am to watch the condors soar over the canyon. By 9am the birds had strong enough thermals to send them up over our heads. It’s an amazing sight. Some of the fully grown birds have a wingspan of 10 feet. The condors start out flying low in the valley. As the sun gets stronger the thermals take them higher up. Soon the condors are flying high over head. Condors soaring effortlessly over the tourists. Soon we were back in the van and heading to Cabanaconde where we began our 7 hour hike into the canyon. We stopped for lunch in a small village. After three and a half hours of descending (we made pretty good time according to our guide, Eddie) into the canyon, we stopped for lunch in a little canyon village and rested for an hour before setting off for another 3 hours to the oasis. Eddie, our guide, was outstanding. He was informative and fun (with an excellent motivational technique of fibbing about how much time/elevation we had ahead of us). The “oasis”… it seems so close. Nothing better than a swim at the bottom of a canyon after a long hike. We made it to the oasis without too much difficulty by 5:30pm – enough time to have a swim. That evening we had spaghetti for dinner and passed out as soon as our heads hit the pillow… despite the prospect of sleeping in a dirt floor cabin with no windows to keep the bugs out! Our cabin for the night. 5am came far too soon and we immediately started our hellish ascent to the surface. It was dark and torches are a necessity. We climbed 1200 metres in three and a half hours. We were exhausted… destroyed. And if I never climb out of a canyon again, it will be too soon, Ryan. We had a couple of stops along the way back to Arequipa: Chivay (for the hot springs and lunch), Maca (a small town with artisanal stalls and llama/condor photo opportunities), and a view point of the volcanoes. We got back home to Arequipa around 7pm. Knowing we had to catch a bus at 7am the next morning we headed back to Amazing Home Backpackers to catch up on some well deserved rest. 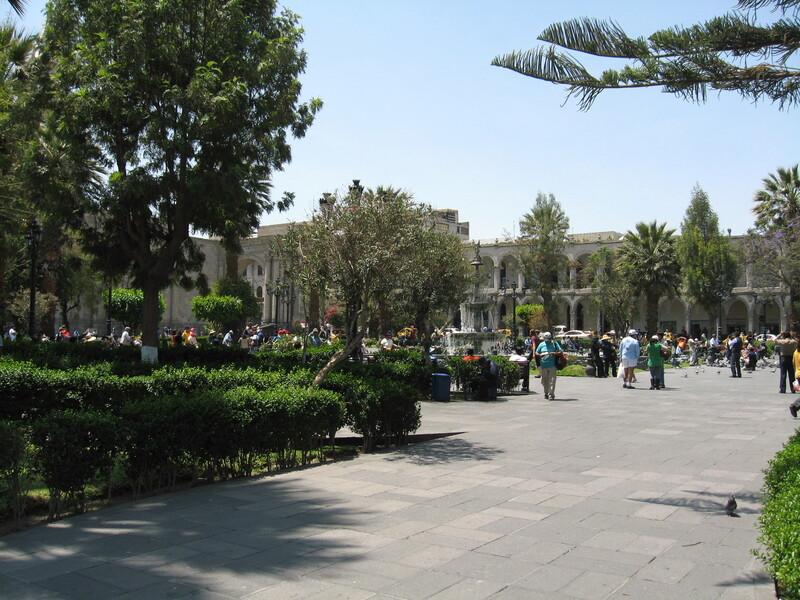 We spent 3 nights and S/328 (CAD$116) in Arequipa. As always this number includes everything: accommodations, food, transport, day trips, and spending money. We went over budget by S/69 (CAD$24) because the day trip and bus fare to Arequipa were a little more expensive than we expected. This means we are now S/259 (CAD$92) over budget overall. Eep! Adios Peru! Our next stop is Arica, Chile.